And this marks the final entry in the track-by-track reverse countdown to the release, on February 13, 2014, the day prior to Valentine’s Day, of my book in the estimable 33 1/3 series. 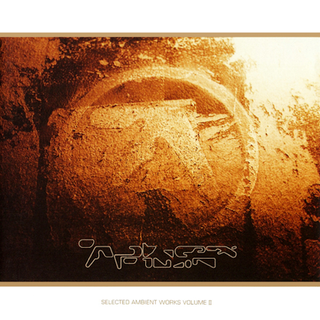 It is a love letter to Aphex Twin’s album Selected Ambient Works Volume II, which will mark its 20th anniversary this year, less than a month after my book’s publication. More on my Aphex Twin book at amazon.com and Bloomsbury.com. The plan is to do this countdown in the reverse order, from last track to first. For reference, an early draft of the introduction is online, as is the book’s seven-chapter table of contents. The book’s publisher posted an interview with me when I was midway through the writing process. Second only to perhaps “Blue Calx,” which is the album’s centerpiece and the closest thing it has to a single, the opening track is the most familiar, if only because as it comes first, its start, if not its finish, is clearly discernible. The rest of the album can become a constant, singular whole except to particularly attentive listeners. It has been widely adopted, and used in film (in the book I speak with two directors who used it in their work, Lucy Walker and Jordan Melamed). It’s a sinuous piece, with a hint of a vocal, perhaps a female, whose wavering is a human approximation of the waveforms that constitute much of the record album.